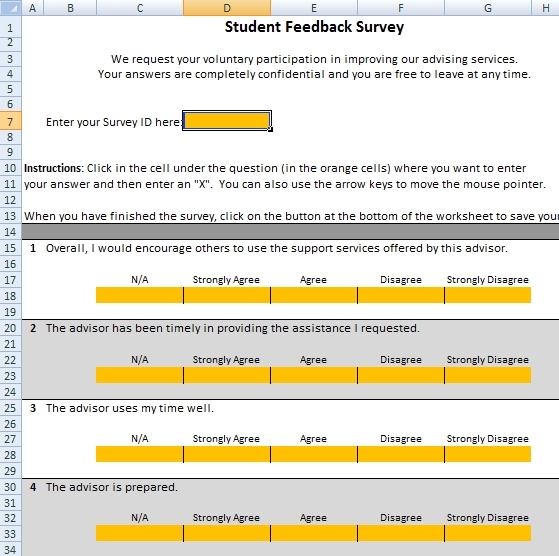 Before Survey Monkey or other online survey resources, I wrote the Student Survey System (SSS). It still provides more information than generalized online tools, but it is a localized program and not online. Student would be guided to a kiosk to answer the survey after their appointment with an advisor. Multiple computers could be used and to calculate the statistics the files from one computer would just have to be copied to another before the calculations were done. The purpose of the Student Survey System (SSS) is to provide an easy way to survey students without needing to use college IT resources. The software enables advising administrators to minimize the time needed in administrating Academic Advising surveys of students and to minimize the time needed to consolidate all the student surveys and report the results. The software consists of three MS-Excel files. A new MS-Excel file will be created for each student taking the survey. The software can easily be changed to use your own survey questions (the SSS User’s Manual will tell you how). And the software is free of charge! I hope you find it useful. Note that these files are in MS-Excel format. It’s not rocket science, but it does use macros to calculate the statistics.